Skip past golf swing instruction and eliminate frustration. Unfortunately. 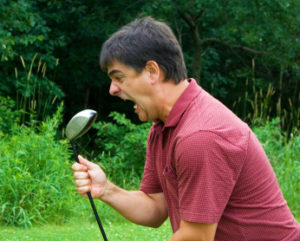 the frustration is built into the method golf is normally taught! Say you decide to go to your local pro for a “tune up” for your golf swing. The pro points out a few flaws and gives you some drills to fix the problems. You go home to practice. All is well… or is it? What is going through your mind? You didn’t realize you were making the mistakes the pro pointed out. You want to make sure you can take the corrections to the golf course. You practice the drills and hit balls on the driving range. Your mind is looking for a way to know if you are doing things right on the golf course. You see, your mind has only ONE WAY to try to repeat the instruction you got from the pro… That is to translate the new movement into some feel that will tell you everything was right or a little off. But right there is where the problems start. Don’t get me wrong, in any other sport but golf this works, which is why golfers do it. The mind is doing what it knows to do, so it’s not the golfer’s fault they have the frustrations they have… So what is the real cause of the frustration? Ask any top pro and they’ll tell you the same thing. The perfect golf swing has “no feel”. It all goes back to one of the most critical factors governing the golf swing… Dynamic Balance, which simply means balance during movement. For the golf swing to work, the body must maintain dynamic balance during the golf swing. If not, the brain will do whatever it has to in order to try and regain body balance. This balancing act is automatic. It’s wired into the human DNA and you have NO CHOICE in the matter. Dynamic Balance is also the reason the perfect golf swing has no feel. In a state of dynamic balance, each muscle group works evenly with its opposing muscle group. Since the muscles are not out of balance there is no feel that stands out, hence why the perfect golf swing has no feel. So how can a golfer remember new movement if there is no feel to know if it’s right? That is the 64 dollar question and it defines the REAL problem with golf instruction. If you are taught how the golf swing feels you are doomed from the very start… Maybe not. There is one place you CAN feel that will tell you if you are swinging the golf club correctly… The bottoms of your feet. Your balance reaction is a response to the effects of gravity. think about what happens when you fall and hurt yourself. Balance is a built in survival action. Well, your feet are the place that interaction between gravity and balance takes place. For every other sport but golf, dynamic balance corrections happen when you take steps during activity. In golf, your feet stay planted so that automatic balance mechanism has been taken away. Without the ability to balance during foot movement, your body can only redirect muscles from your golf swing to the task of rebalancing, which changes the golf swing and makes those “funny” shots you blame on a bad golf swing. The real culprit most of the time is your balance. The timing between the upper and lower body and how power is built and released during the golf swing. Timing is the reason why you can have a golf swing that looks great but doesn’t quite make the shots you are trying to make. If this sounds new to you, it’s not. I have read just about every bit of golf instruction written since the early 60s in an effort to crack the golf swing code and the common thread in the early years that I always read from the greats on tour is that the golf swing comes down to balance and timing. I took me a number of years to truly be able to understand and explain how balance works during the golf swing. Now I teach it to golfers in as little as 30 minutes. Timing is a little trickier, but once you have balance down, timing is much easier to master. Oh… Did you notice we didn’t talk about your golf swing mechanics? We don’t have to because the balanced body will always return the same golf swing. More importantly, the golf swing created by maintaining dynamic balance is the golf swing that perfectly fit YOUR body. In balance, your golf swing is its most efficient, and in good timing, it is its most powerful. All without effort. I have been teaching this to thousands of golfers all over the world for almost 20 years in my Golf Swing Control course. 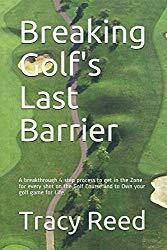 Now I have written all of this down in a book called “Breaking Golf’s Last Barrier” which goes from how to maintain balance and how to find the perfect timing for your golf swing to the short game, putting, and the true mental game where I teach golfer to intentionally think through their subconscious during the golf swing to play every golf shot in “the zone”. It’s all there, 30 years of research that all started because I was frustrated every time I hit a bad shot on the golf course.